Like nearly everyone else in Paradise, Ohio, local laundromat owner and stain-removal expert Josie Toadfern eagerly awaits the upcoming July 4th Founders Day celebration with its highlight, the annual Breitenstrater Pie Company pie-eating contest, sponsored by the owners of the town's upper crust enterprise. But things may not be so sweet this year, what with juicy rumors flying that a black sheep Breitenstrater wants to spill the beans about some deep, dark family secret. And when a pie-making bigwig suspiciously drops dead after sampling the company's latest wares, Josie leaps into action. She loves her teeny-weeny community, despite its blemishes -- and any stain on its reputation must be eradicated! But if she sticks her thumb -- or her nose -- into this particular pastry, she's going to pull out more than a plum#133;and she may end up getting her own lethal just desserts. I enjoyed this one. It was very funny in places and there were some good stain removing tips. This is going into one of my virtual bookboxes. Sent to MaryZee, who chose it out of my Coffee, Tea and Dessert VBB. Enjoy! Thanks for sending me this book so quickly, and thanks for the extra books and goodies. Looking forward to this read. I think if I found more in this series, I might read them, but I'm not sure I'd seek them out. Thanks for sending this to me Loveamystery. I'll be saving this for an upcoming cozy mystery bookbox. Putting this in Affinity4books' Cozy Mystery bookbox. Hope the next reader enjoys! 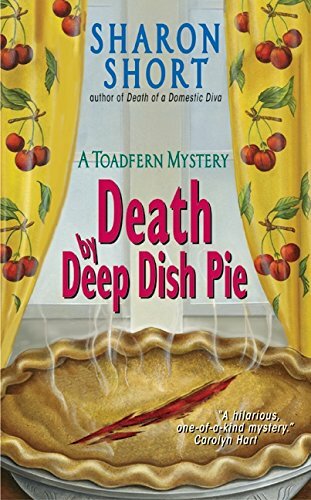 I couldn't resist this one from the cozy mystery bookbox!